Dimensions: 10.5 in. x 5.5 in. x 4.5 in. 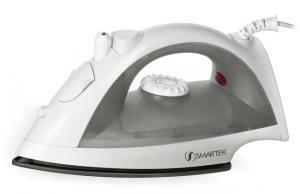 Smartek irons ensure a hassle -free ironing experience. With options such as ironing with or without steam, variable steam and heat control, bursts of steam and water mist, any garment is bound to be crisp and crease less. For advanced ironing performance the Smartek steam iron also features heat indicator light, self clean option W/ anti clogging valve and a non-stick sole plate.